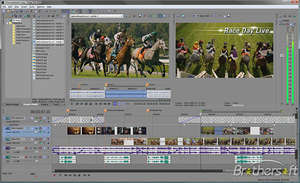 Sony Vegas Pro is a powerful video editor aimed at users looking for some professional-looking and sounding results. Sony Vegas Pro is definitely one of the most well-known programs among amateur vloggers and combined some powerful video and audio editing features. One of the main selling points for this software are the powerful and professional-style features it offers. It also uses GPU acceleration which optimizes resource usage on the PC it is being used on. Sony Vegas Pro 11.700 is a shareware program and can be used as a demo to try the software until the free trial period has ended. A full version of the program is available after the trial period ends. For security reasons, you should also check out the Sony Vegas Pro download at LO4D.com which includes virus and malware tests. Additional screenshots of this application download may be available, too. Sony Vegas Pro has a presence on social networks.